Fabulous Frogger: Hoops, scroll bars and lapstands, oh my!! Maybe I'm old fashioned, but I love using the embroidery hoop for my stitching. I've tried all the different hoop sizes out there and have come to the decision that my favorite size is the 5 inch diameter. I've seen pictures on other's blogs where they use the scroll bars or the Q-snap, but I don't know if my wrist can handle holding something so big for so long! Then the idea of having a lapstand that holds my hoop comes to mind, but part of why I like my little 5 inch hoop is that I often like to turn it to the back and make sure my back stitches are lining up nicely. I also don't like the idea of spending hundreds of dollars just to find something to hold my material!! I'd love to hear what others are using or doing with their stitching! 10/05/2011 - Filling in all the white and gold. 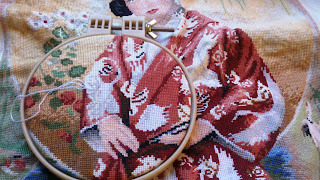 It's difficult to tell, but the birds on her kimono are either white or gold and I left that stitching for the end. The flowers by her right shoulder are also white and need to be complete. I didn't get as much done as I hoped, but a little progress is still progress. I left the white and gold stitching for last because I didn't want the white thread to get dirty and I didn't want the gold thread to get any kinks in it from having the hoop clasped over it. You can see the history of this work here. I also wanted to share how much I'm enjoying having my blog!! I'd like to thank Cross Stitch Queen from Between the Stitches and Carolyn from Taking one stitch at a time. I appreciate that they took a moment of their day to post a comment that inspired me to want to blog and stitch more!! Thank you!! Carolyn is also having a giveaway - Happy BOO 2 U! You can enter here. The giveway ends this Friday, October 7th so you have a little bit of time to join! Happy stitching (and frogging if you're like me)!! Looking forward to trying out vinegar. This perennial grass grows in tropical, sub-tropical and the transition zones. Doing a huge paint job and find you get paint on cupboard handles when you go get a drink of water? Slip a loop of cardboard tube over the door hardware and you can grab a glass easily.